What’s the Regginator Planning With the Wii U? Forbes has posted a new interview with Nintendo of America head Reggie Fils-Aime. The interview focuses on Nintendo’s new and upcoming console, the Wii U. While the interview repeats a lot of what we’ve already heard about the Wii U, it does clarify a lot of little details. 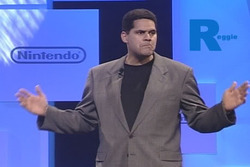 Of particular interest are Reggie’s comments concerning third parties and the Wii U’s online system. In this case we’re saying that this two screen experience -either two screens playing the same game or two screens doing fundamentally different things- is the future. Nintendo has always been innovative; it’s what they do. When we look at what Sony and Microsoft have been up to lately, yes its innovative, but they’re clearly trying to one-up Nintendo. For instance, Microsoft’s Kinect and Sony’s Move are evolutions of the WiiMote. The type of technology behind Kinect would seem like the natural next-step for Nintendo, but instead Nintendo went and did something completely different; you got to hand it to them for that. I’m so relieved whenever I hear about how much Nintendo is working with third-party publishers on this one, but all the information we’ve received concerning anything online as been vague at best. Right now I think the Wii U’s online system is still under lot of development, and we won’t hear a lot of specifics until next year.